When I purchased my house about two years ago, I remember the constant search for a place full of opportunities. To help my search, I developed a mental list of several factors that would influence my decision to purchase a house; first, the house had to be located in a growing neighborhood and second, the house had to be in relatively decent shape so that I could learn some construction skills through renovations. 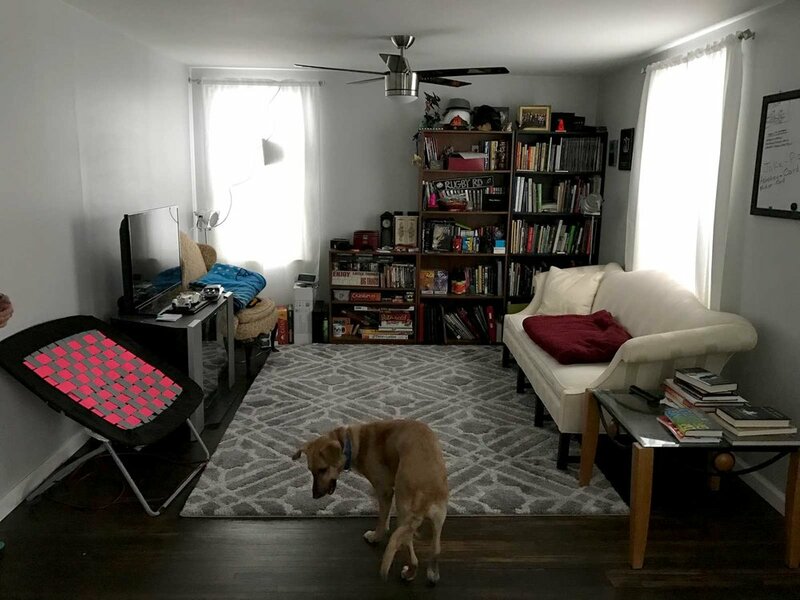 After a few months of searching, I found the perfect house in a fast growing neighborhood of Buffalo, NY, listed at a fair price, and containing a majority of my list of characteristics. Once the negotiations were over, I purchased the house, unlocked my house, walked inside, and realized that I had a lot of work to do before I could call this place… home. As soon as I entered the living/dining room space, I immediately noticed the smell of cigarettes and remembered that everyone in the family (except for the baby) were smokers. However, when I visited the house, they masked the scent with air fresheners and I was so excited that I totally missed this issue. Anyhow, I bring up the cigarette smell because I took my time analyzing every detail of the space and noticed that all of the surfaces had a slight yellow/orange tint. Yes – this was from all of the indoor smoking and years of accumulation on the surfaces. So I quickly came up with a plan to clean and refinish a majority of the house. After opening all of the windows, I came up with a quick plan of action for my first house flip ever! Keep in mind that I was born and raised in an apartment in New York City, so the only experience I’ve had with tools are from my time in architecture school. To keep this post as brief as I could, I’ll go over the two largest spaces that were renovated in the house. In the living/dining room space, I decided to rip out the old carpet, throw away the fabric window blinds, remove the textured ceiling, close off the door by the window in the living room, throw away the old ceiling fan, and re-stain the old wood floors. So the first step was to carefully remove the old carpet and hopefully reveal hardwood floors in good condition. I carefully removed a small area of carpet at the corner of the room and saw that the original wood floors were in good condition. So I quickly peeled the rest away, rolled it up, and tied it up for the garbage truck. Then, it was time to take on the nicotine coated textured ceiling. As an inexperienced carpenter, I was cautious with scraping off the textured ceiling in case it was painted with lead paint or contained asbestos. So as a safe architect, I geared up in my bunny suit! With the carpet gone, tack strips out, staples pulled, textured ceiling scraped off, awkward closet door removed, and old ceiling fan in my donation bin to my local habitat for humanity, it was time to fix some areas of the wood floor. After pulling out the carpet, there was an area infilled with a plywood panel that shows where the old wall for the previous bedroom was located. To match the adjacent hardwood floor, I pulled out the plywood panel, pulled some engineered wood floors out of the bedroom closet, and filled in the missing area of the living room floor. Then, I cut some 2x4’s to frame the area where the old closet door was located and covered it with drywall. I’ve never worked with drywall before so you bet this was quite the experience! 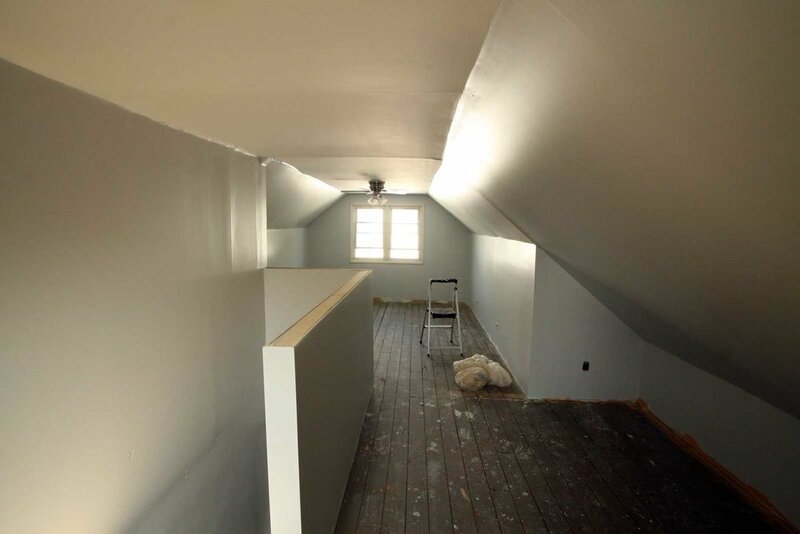 Now, it was time for the fun part… priming and painting the entire room! I went with a primer that had very good reviews for coating over and sealing surfaces that were subject to lots of indoor smoking. So down went the plastic tarp, and on went three layers of white primer followed by a beautiful grey/blue paint on the walls and white paint on the window trim! Once the paint was on the walls, I had a discussion with a good friend of mine who helped me paint the window trim and decided I should sand and stain the wood floor. Although it’s a little difficult to see in the photographs, the floor was discolored and scratched in a lot of areas. Ideally, I should’ve sanded the floors before painting the rooms, but off I went to sand the floors! After the floors were wiped down with some damp towels, I decided to go with a darker stain and experimented with mixing 50/50 of two different stain colors. I opened all of the windows, stained the floors, went to my apartment to sleep, woke up, and added layers of polyurethane. And of course, here's the before and after! 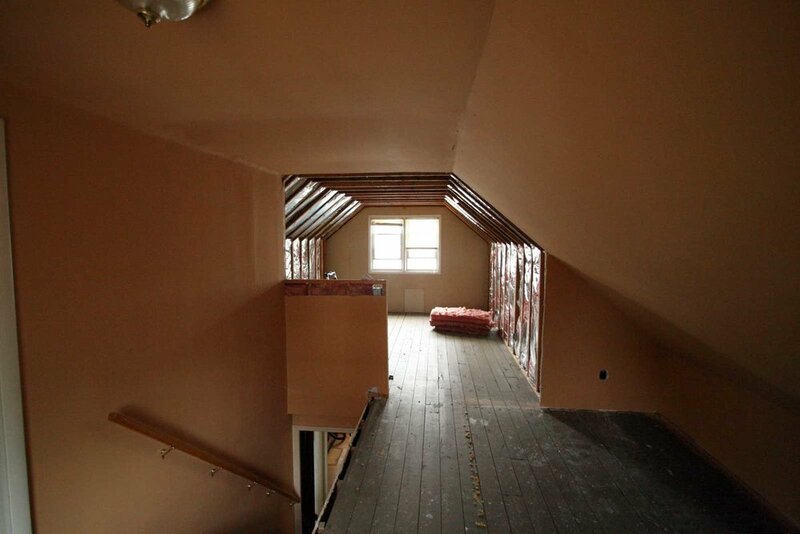 Upstairs, the existing attic was used as a bedroom with a walk-in closet to the right of the staircase and a secondary room where the stair is located. I decided to completely open this space up and build a half-height wall in place of the guardrail. In the following pictures, you’ll see that they made the bedroom using thin MDF boards. Since I was so excited to begin my renovations, I immediately smashed a hole in the wall to see what was behind! For the renovation of this space, I decided to throw out the carpet, remove all of the MDF boards in the bedroom, remove the tile ceiling, remove the old ceiling fan, and cut a portion of the wall to make it a half height wall. So off I went to carefully remove the wall panel, door, and a part of the wall that bisects the attic. Then, it was time to pull out the old carpet, cut the wall in half, and throw out all of the trash that began accumulating in the attic. You can see how much brighter the space has become with that simple change. You can also see my simple set of tools that I used for most of the renovation. I was definitely working on a very tight budget. Once the other part of the half height wall was framed and anchored to the floor joists, I called over some friends to help me bring drywall to the attic (which I’ll get delivered on future projects…) and another group of friends to help me hold the drywall in place while I anchored them to the studs. When they were all in place, I looked up tutorials on mudding drywall and attempted it the next morning! The next day, I looked over my work and was impressed at how it all came out – except for the area where two pieces of drywall were off by about half an inch. Anyhow, it was time to sand the drywall, prime, and paint! With the walls painted, the room finally started nearing completion and I was excited to see this much progress! The natural light entering the space and reflecting off of the new color of the painted walls was filling the attic space. The only thing left to do was to paint the floor boards a dark brown to match the living/dining room space. So off I went to clean up my mess, get all of the mud and dust off of the floor boards, and start painting! Once the dark brown paint dried, I cut and installed wood bases and a wood sill on the new half-height wall. I painted them white, capped off the outlets, and the studio space was complete! To complete the home renovation project, I pulled the old carpet off of the stairs, painted the runners the same dark brown as the attic floors and painted the risers white. That visually tied the first floor finishes to the attic and made the house feel like a whole. Finally, it was time to move my things in and with the help of my girlfriend, who I met after the house was renovated, we slowly organized the house with our belongings. As she moved in, we began filling the house with furniture, pictures, books, and other personal belongings. Memories began to fill the house and we started creating more memories of our own. A house is a type of architecture waiting to be filled with the presence of its inhabitants. This combination of a house and the people who live within its walls are what make it a home. I hope you enjoyed this quick overview of my home renovation from the past! Thanks for reading and let me know your thoughts in the comments section below! This post is part of the ArchiTalks blog series hosted by Architect Bob Borson owner of the blog, Life of an Architect where a topic is chosen for fellow bloggers to interpret and write about. This month's topic was "House or Home?". Check out some of the other posts from this series by clicking on their title below! House or Home? It's in the story. House or Home: One's a Place, the Other a Feeling.